Today the 8 of us, intrepid travelers hired a minivan and driver for the day. 600 baht per hour divided by 9 , divided by 30 ..... Such a bargain. We yelled stop when we felt like it but we did have a plan. Michelle, the weakest member of the group, was voted off the island today, and had a day in self imposed isolation, to recover from being up all night feeling sick. Nurse Ratchet diagnosed, too much beer, too little water, and too much fun!! We headed off to Fergie's resort for Freddie to check out the day spa. Beautiful views with natural breezes accompanied the spa manager who was rubbings his hands together at the thought of 8 new clients Only F booked, others contemplating. Second stop elephant rides and tiger photos. Don't worry, we were all disgusted in ourselves for supporting these activities but we did it anyway. Do I look like I am enjoying this experience? We all were justifiably worried but did it anyway. 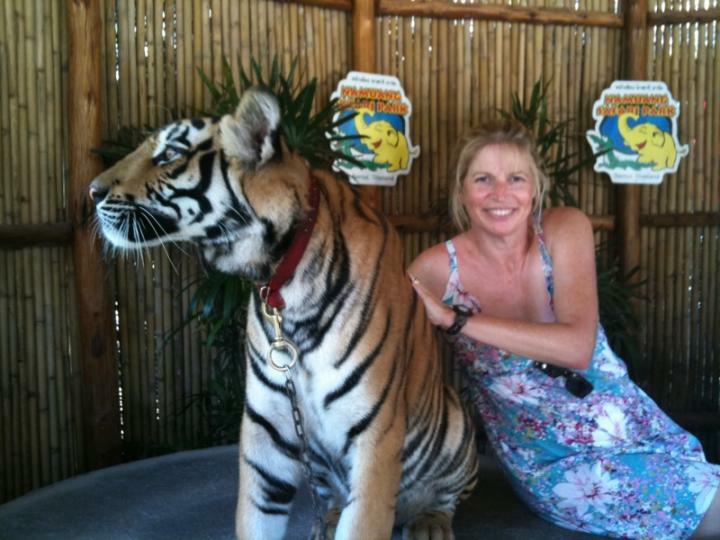 I asked if the tigers were drugged, had teeth, claws? Not drugged and yes to teeth and claws. Wendy is visibly frightened in her photo. The elephant ride was fun. In twos we ventured on a half hour jaunt up the road, thru the bushes alongside the stream and around the zoo. We were all sold bananas and the cheeky monkeys (I mean elephants) would put their trunks up and over their backs for us to feed them - skin and all. The trainers for a price, offered generously to take photos of us on the elephants - which was so appreciated as our photo taking was hampered by the swagger of the elephants. On the road again we continued around the island and stumbled across five island bay and resort , where we swam in the wet edge pool, ate at tables on white soft sand under the coconut palms , lazed in hammocks and swum in the clear blue sea. Further round the island we stopped for an hour at theBig Buddha. Number one tourist attraction in Koh Samui. As luck would have it the monks blessed F, and we were able to shop successfully in the markets surrounding the car park. Heading south again on route to Lamai, a quick photo opportunity, then a rendezvous with Michelle at Maccas. We quickly headed for the clean toilets if the resort next door and decided the delightful table on the edge of the beach under the coconut tree hung with red lanterns would do us just fine for the evening. We swam in the warm ocean, lazed in the even warmer pool, ordered cocktails during happy 4 hours :))), and enjoyed a meal sitting in the balmy night air. We are a home now, tucked up in bed. Tomorrow is a 7 am start for all but F and C, who are indulging in the Kambala Day Spa - the rest if us, are heading 2 hours by speed boat to the national marine park, to snorkel and kayak.